There are many so-called McQueen fanatics out there. People who portent to know everything about everything to do with the man, the myth, the legend, and, admittedly, I’m one of them: agreeing ferociously with people while they pontificate about McQueen’s legacy, quickly imbibing their knowledge and passing it off as my own. And I’m not the only one. Then there’s people like John Matheson: true buffs, collectors, obsessors, the ones who are devout disciples not only of McQueen himself, but the entire universe he created. Matheson started the account late last year, and has since connected with people from within the McQueen fold, as well as those, like him, who tore pages from magazines and trawled vintage shops and websites for everything from garments to show invites. Matheson, and his community of commenters – many of whom were in the original McQueen creative clan – are what one might call McQueen stans. With Matheson’s account demonstrating just why so many are still so devoted to McQueen, we caught up with him to discuss its inception, what it takes to produce such a precise, knowledgeable archive, and essentially just geek out on the legendary designer for a little while. Why did you start the archive? @mcqueen_vault: I’ve had a physical archive of magazine tears for over 25 years with the majority of content dedicated to Mr. McQueen. I recently experienced the loss of a parent and needed a focus to keep me distracted, so I decided to organise all the content, which means so much to me. Sharing this on an Instagram account seemed to explore my interest in McQueen and show people some unseen aspects of his total body of work. I was also inspired by Ilius at @unforgettablerunway whom I greatly respect, and a beautiful Tumblr called The Widows of Culloden, which had a similar collection to mine. Incidentally, I have very little interest in digging through his private life. The biographies and sensationalism surrounding his personal life are none of my business, and feel quite invasive. Where do you find your imagery? @mcqueen_vault: I’m originally from the South East of the US, and in the early 90s had to wait for Women's Wear Daily or Elsa Klensch to feature the collections, sometimes a month after they happened. From there, I started my own library of content categorised by year, collection, and editorial work, mostly from magazines. Then when research became easier, I started a digital archive comprised video and multimedia content. I'm also lucky enough to have a small archive of clothing, invites, accessories, and shoes that I've either acquired or have been given by very gracious friends. It’s critical to experience McQueen by seeing or feeling his structured shoulder, the contour of a heel, or touching the weave of a jacquard to help understand his mood and references. Your points of reference are so meticulously outlined. How do you go about finding everything out? @mcqueen_vault: I try very hard to trawl the internet to credit all the creators and artists that were involved: trust me, the followers are quick to correct! I've also tried to get my paws on every book about him, both good and bad, to gain insight into references and resources. My background is in fashion but I'm not formally trained in design, so I have to work to make sure I can vaguely account for things in a meaningful way to respect all the creators. That respect for everyone at McQueen is important to me. Why McQueen over other designers? @mcqueen_vault: He was British, and his work feels authentic and impactful. I'm a sucker for Anglo-centric things, but more importantly it’s because through that culture he delivered a powerful story. He created magic directly from his soul, yet was scrutinised because of his social class, body-type, sexual preferences, and appearance. I love that he fought back ferociously while completely grounded in technique, intelligence, and peerless skill while spitting East-London attitude. That means so much to me as a gay man from a small town. I think people forget he was not just a visionary in fashion, he broke the norm of the package talent can be wrapped in. And most people may not realise it was that talent and drive that completely shifted our eye and changed silhouettes by elongating the body line, which is something you don't really see anymore. A guy from Stratford did that! It's an incredibly real story. 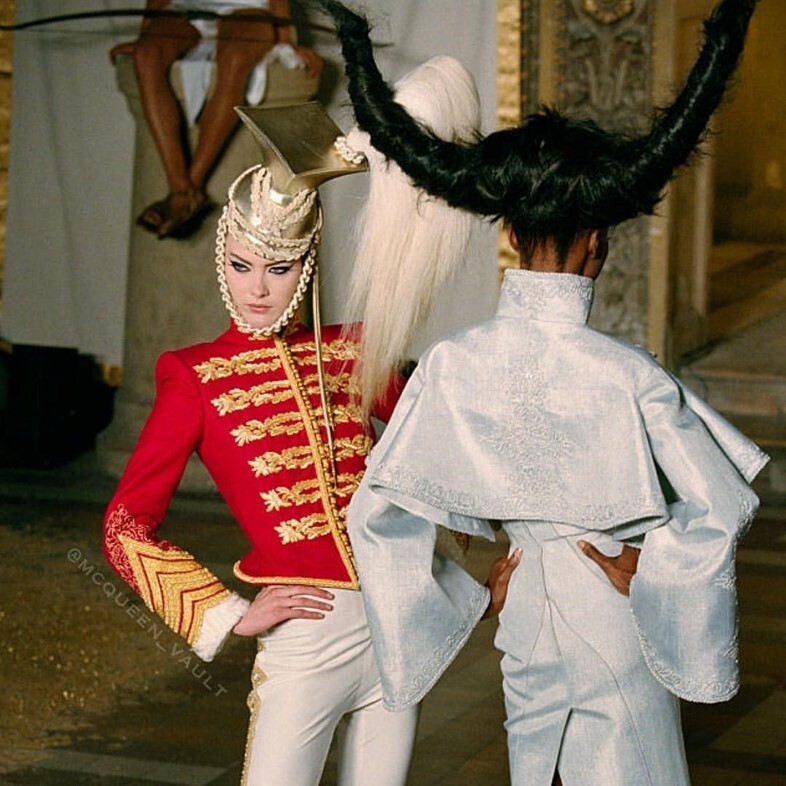 What do you find the best or most interesting McQueen period, and why? @mcqueen_vault: This is a big question, and my answer changes regularly. I'll try to give you an average history of loves. His shows have such different moods. Several that I can watch ad infinitum are: Givenchy’s AW98 ready-to-wear show – with the replicant heroines of the Bladerunner collection, then his Givenchy revenge-against-the-establishment Couture in the form of the Victorian weird science of Eclect Dissect from AW97. The wind-swept highland novella of The Widows of Culloden. The menswear collection from AW06, which was inspired by Bram Stoker, and finally the insanely perfect political satire of fashion that was The Horn of Plenty from AW09. There's truly so many collections I love – ask me again and my answer may change. Is there a time you find disappointing, and if so, why? @mcqueen_vault: Yes, this is funny to me! The 2005-2006 period. Between his Hitchcock-ian The Man Who Knew too Much collection, and the Amazonian supermodel adventure of SS06 Neptune. Both themes you know he should have blown away, yet when he passed them and hit the next collection The Widows of Culloden, you can immediately see those two collections were not his usual escapist heaven that we had come to expect. McQueen appealed to me most when there was a razor-blade hidden in the cake of a collection. A little something to draw blood and incite a little gasp or thrill. What kinds of imagery do your followers most respond to, and why do you think that is? @mcqueen_vault: People across the spectrum feel so much about McQueen because you can tell there's so much of him in the collections and we connect to that. As far as popular content goes, rare Givenchy McQueen creations, unseen details from collections, close-ups of construction from my personal archive, and dramatic showpieces always garner loads of likes. Also popular are the videos which I re-edit based on ongoing themes I explore, which while time-consuming, I feel is so important. It's so impactful to show the collections within the context of John Gosling’s sound design, who I think is truly one of the most important people in the McQueen universe. Perhaps the best thing about starting this account has been seeing just how many people are passionate about the legacy of McQueen.